Updated Wednesday April 10, 2019 by Plainfield Junior Cats. TONIGHT - WEDNESDAY 4/10/19 - Take the family out for dinner and register for the 2019 Football and Cheer season!! Join Plainfield Jr Cats Football & Cheer at Vita Bella Pizza (12443 S Route 59, Plainfield) from 5-8pm for our fundraiser and open registration event! 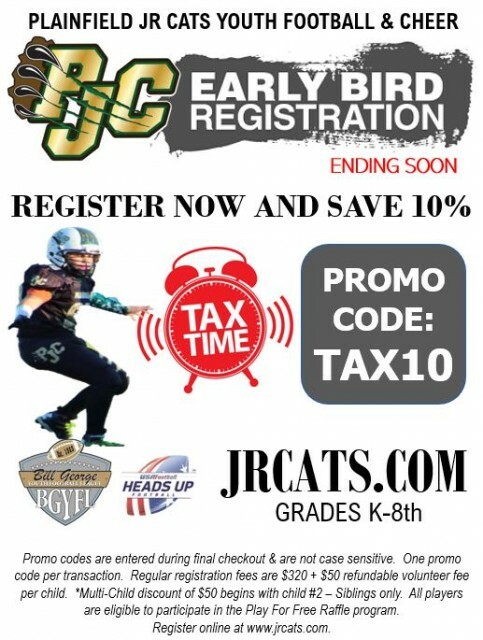 15% of all orders with come back to PJC to help pay for uniforms, field & light fees and equipment. Early Bird Registration is ending soon! Register at our event tonight or online now with promo code TAX10 and save 10% off regular registration fees!